A few weeks ago, I was able to sit in on a read through of Taming of the Shrew. I know the play; I knew the lines. But listening to those actors in that room on that day, the language really came alive for me. The actors brought parts of themselves to the lines, and then interacted with the other actors to bring the speeches to life. The words became living, changing things as I heard them. This reminded me of an experience in a 10th grade English program. I came in to help the students understand a play they were studying. I worked with three different classes in one day. All the students were 10th graders attending the same school. In theory, the experiences with the same lines from the same play should have been—similar. But different children brought different “selves” to the lines, interacted in their own way with others in the room. All three classes interpreted and presented the lines in entirely different ways. It was exciting to see the lines come to life through the students’ work. Those student actors in that room on that day created the play and the world of the play themselves. It was truly exciting to see it happen three different times. Teaching students to experience, live, breathe, and perform Shakespeare allows them to bring the words to life. 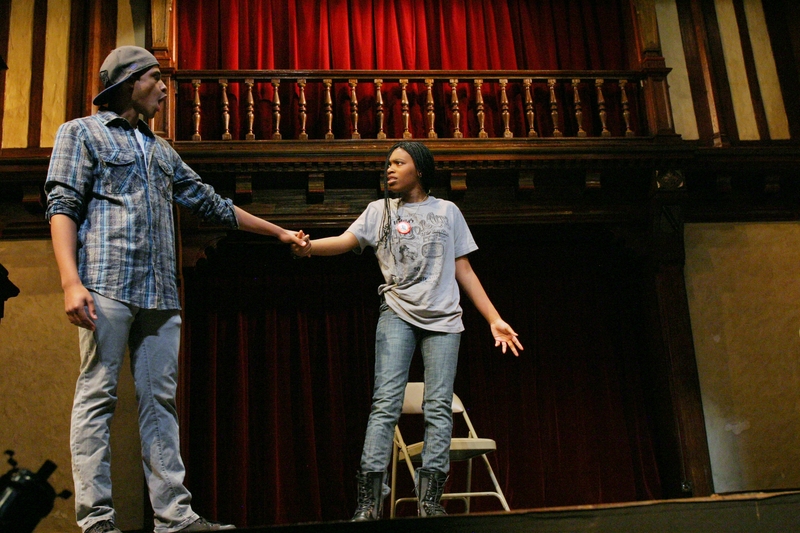 How do you encourage students to have a real experience with Shakespeare? Carol Ann Lloyd Stanger is the Docent Liason for Folger Education, a frequent contributor for Making a Scene, and a published writer for Calliope magazine. As I write this, we are about two weeks from our first audience for the Folger’s production of The Taming of the Shrew and I still have no real idea how to say Kate’s final speech without offending somebody! After almost twenty years as a professional actress, I have learned that individual audience members will interpret what they see the way they want to. If they watch that final speech with their arms crossed and a scowl ready on their faces before I even begin to speak, that is something I have no control over. The most I can do is try and remain consistent in the portrayal of my own ideas about the character and by following clues within the text, I have a powerful weapon in my arsenal. can serve to take the sting a modern woman might feel in such submission by applying the logic that Kate does not mean what she is says and is basically calling the sun the moon throughout the entire last speech. I would help Cody and give him a lift up in the world any way I could and never could conceive of that sort of love until I found him. Now, as an actress, I would of course need to play this with whichever actor was across from me, but having Cody there sure makes it easier. So the true love Kate found with Petruchio combined with a textually supported healthy sense of wordplay have ended up as my particular weapons against stubborn audience members who are determined to be offended. Whatever they think, all will certainly see a happier Kate at the end of the play, and to me, that’s a story worth telling. What questions do modern students have for Katherina Minola? Post them in the comments and Folger’s Kate and her compatriots on the ED blog will respond! In the olden days, families might sit around the parlor reading Shakespeare’s sonnets and plays together for the day’s entertainment. In 2012 we’re shaking it up! This past Saturday, Danielle Drakes and I had the privilege of working with an enthusiastic mix of 6-12 year olds and their parents in a workshop we called Shakespeare in Action! We had a fabulous time introducing Shakespeare’s language, some swordplay and creating scenes from Macbeth. 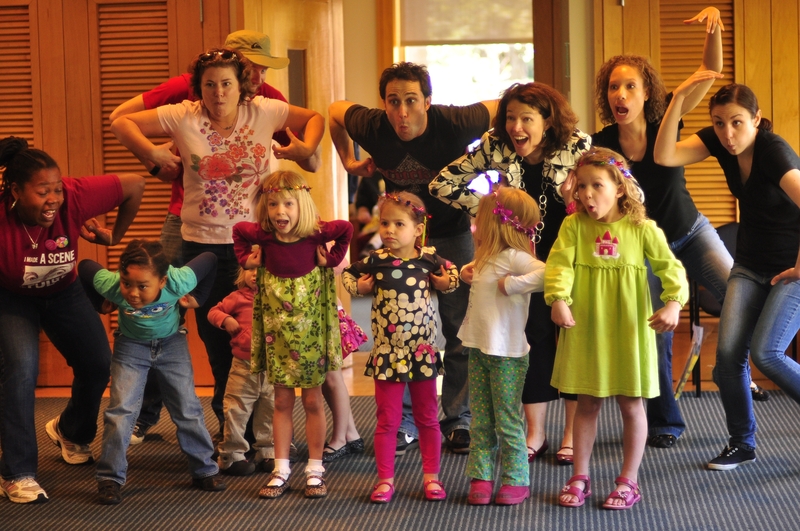 The children and adults took to it likes flies to honey: immersing themselves in the playfulness of our activities and rollicking in the language of the Bard. Kids loved pelting their parents with Shakespearean insults as well as imaginary snowballs in our warm up activities. The parents didn’t hold back either! Interestingly most of them, including the adults didn’t know much about Macbeth. Once we explained there were swordfights and witches, it was on and it was thrilling to see these families engage with Shakespeare so fully. The morning went by so quickly that we should have called it Shakespeare on the Fly! But sometimes doing drive by Shakespeare leaves them eager for more which was our intention! What was really great for us was to find out the reasons families chose to attend a Shakespeare workshop in a dark theatre on a bright sunny Saturday morning with the Cherry Blossom Festival blooming all around us. Besides the young boys who came mainly for the sword fighting, most of the parents just really wanted to expose their children to Shakespeare in a different way than they’d been taught. Also, having the chance to do something together that was out of the ordinary also seemed to have a certain appeal. For the kids, I think the experience is priceless. It’s one thing to learn about Shakespeare and the plays at school, it is quite another to really experience the work with your first teachers, mom and dad. What was your family’s exposure to Shakespeare? 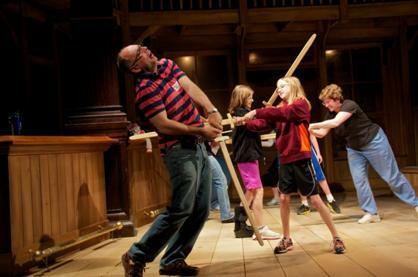 How are your kids experiencing Shakespeare now? World Shakespeare Festival Begins April 23rd! The World Shakespeare Festival (WSF) starts April 23rd. It is a celebration of Shakespeare as the “world’s playwright.” The Royal Shakespeare Company is producing the event, which runs until the November. This event is an unprecedented collaboration with leading UK and international arts organizations. It’s the biggest celebration of Shakespeare ever staged. Approximately 60 partners will be coming together over the next few months to participate in the Festival. According the the RSC’s website, “Thousands of artists from around the world will take part in almost 70 productions, plus supporting events and exhibitions, right across the UK, including London, Stratford-upon-Avon, Newcastle/Gateshead, Birmingham, Wales and Scotland and online.” Over 1,000.000 tickets will be on sale for the festival. Folger Education will be participating in the Worlds Together Conference to be held in London, September 6-8. Are you planning to attend any of these events this summer, when school is out? You may have seen the little note in this month’s BardNotes E-Newsletter (not registered yet? SIGN UP HERE! ), but we want to know how you’re celebrating April 23rd with your class! What’s on April 23rd? Shakespeare’s Birthday! At the Folger we celebrate big-time. After some celebratory lectures and events in the Theatre, we throw a big party for the neighborhood with something for everyone on the Sunday closest to the big day! Reading Room tours and Scholarly Q&A’s in Shakespeare’s Lounge; Elizabethan Crafts and Active Shakespeare Workshops (pictured); Sonnet and Portrait contests; Entertainment and Refreshment; opportunities to learn about Elizabethan life and the Folger Library itself (straight from the mouths of its founders! ), and – of course – more! This time of year is always pretty exciting for us – and since we know everyone loves a good party, we’re sure you’re planning something fun as well! Let us know in the comments (or email educate@folger.edu), and we’ll share ideas submitted by Friday, April 20th on Tuesday, April 24th! Earlier this week I attended the first rehearsal for The Taming of the Shrew, Folger Theatre’s next production. Having recently seen several interpretations of this well known play at our very successful Secondary School Festival last month, I was reminded that when we engage in a Shakespeare play it can always be different. For one, the infamous Induction scene which opens the play, is often played obligingly and with no real connection to the larger story. Or, other times it is cut entirely from the production. After all, its seems to exist as a way of framing the commedia used throughout the play contextualizing the use of yet, another way of storytelling. To know this play, Taming, is to know that Shakespeare was saying something very specific about culture, gender roles, marriage, money, and power. Shakespeare intends to amuse by creating laughter. His edgy and profane poetry, in addition to using the commedia style, elevates our experience of the world that is created in (and around) Padua. Yes, I have read the play. Seen the play. Talked about the play. However, before this week I had not actually heard the play. I listened to the this cast speak these words for the first time together seated around a table(not on stage, no costumes, and no set). Using only the words they were able to illuminate Shakespeare’s sense of play, conflict and a resolution that we can accept. OK, most of us. Particularly, if we can move through any strong feelings we own on one side of the coin, or the other, we will pick up what Shakespeare was putting down. And when we do, we can enjoy language full of energy and vigor which is highly appropriate for a play that explores themes of aggression and physicality. As it happens—all jokes aside—Taming exists in a world where Kate and Petruchio actually work. After all, it’s a comedy. Have you recently read or played with this text for a production of The Taming of the Shrew? What was your experience? What works for you and your students when reading around the table? How have you and your students understood the play by way of the language. Did you face any challenges? with The Taming of the Shrew? In my extra-curricular reading travels, I’ve recently come across a lovely book from the 19th century entitled The Girlhood of Shakespeare’s Heroines by Mary Cowden Clarke. One must wonder where the characters for these very strong (-minded, -willed, -convictioned) women came from, and she provides a clean, clever, and interesting viewpoint for the women Shakespeare wrote. 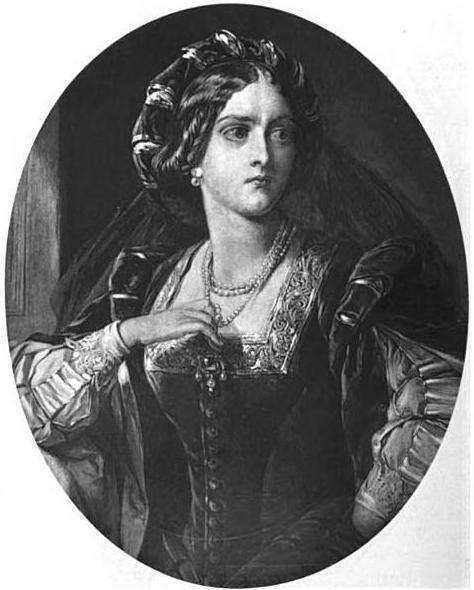 From Helena to Ophelia, several characters are explored in rich detail because she noted that girls were not relating to Shakespeare very well, and wanted to show them that women were very much represented with many faces in Shakespeare’s canon. Mrs. Cowden Clarke was actually quite a remarkable woman: at 18, the year after she married, she set to work on a 12-year project, the Concordance to Shakespeare’s works, a Verbal Index to all the Passages in the Dramatic Works of the Poet, which she published under her own name. After then writing the 15-essay collection, Girlhood, she set to work with her husband to edit all of Shakespeare’s works (she was the first woman to do so). She did not appreciate the “Bowlderization” of Shakespeare’s work by a different female editor, Henrietta Bowlder, who “cleaned up” Shakespeare’s text. THEN, Mrs. Cowden Clarke continued to work with her husband on The Shakespeare Key, unlocking the Treasures of his Style, elucidating the Peculiarities of his Construction, and displaying the Beauties of his Expression; forming a Companion to The Complete Concordance to Shakespeare. My main interest in this collection lay in Katherina Minola – she was the reason I had sought out the book in the first place because of a quote in Shakespeare Inside, by Amy Scott-Douglass. In it, Scott-Douglass notes that after Katherina’s temper lands her in a convent as a prisoner (she’s locked in a dark, quiet room to keep her tamer), Katherina becomes enthralled with a painting of Saint Catherine, and spends many hours sitting and looking at the painting in order to memorize the face of the saint. The nuns admonish her for being irreverent and enjoying the painting, and not praying on her knees to it instead. Two parallels come to mind for me, and take them as you will: 1) as Scott-Douglass notes, that Art in a Prison is a welcome escape from the walls of the place, into a spiritual haven of sorts. 2) that worship of a work of art and studied enjoyment of the same work are not one and the same experience. The former misses the beauty and versatility of the work, and the latter grows from the experience of studying it. All of the links to Mrs. Cowden Clarke’s works are to Google Play, where Free E-versions are available to download to your mobile devices or computers. What are your thoughts on Katherina’s experience with the painting of Saint Catherine? How does her experience in the convent relate to your students’ experience with Shakespeare’s plays? What captures them about the work?